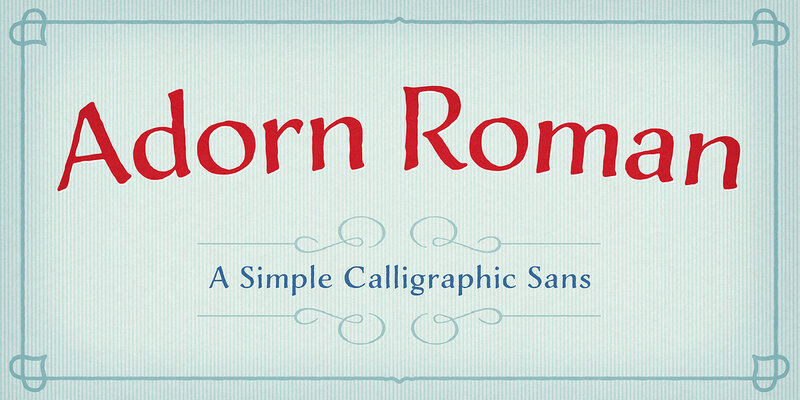 Adorn Roman is both a display and text typeface marked by its traditional calligraphic hand. Technically it is a humanist sans, with tapering stems and high contrast in its thicks and thins. It was created with a chisel-edged calligraphy pen, and even digitized it has the look of what a designer might create with a calligraphic tool. With more texture and character than you’d typically find in body text, it brings a softer, warmer look for small groupings of words. The lowercase adds a practicality to the collection with its ability to convey information without straining the eye. A font family published by Laura on Tuesday, July 26th, 2016 that has 1,998 views so far.